ESD released its study supporting the Queens neighborhood as a key component of the city's developing its life sciences industry, shortly after Alexandria purchased The Bindery at 30-02 48th Ave. in LIC for $75 million. 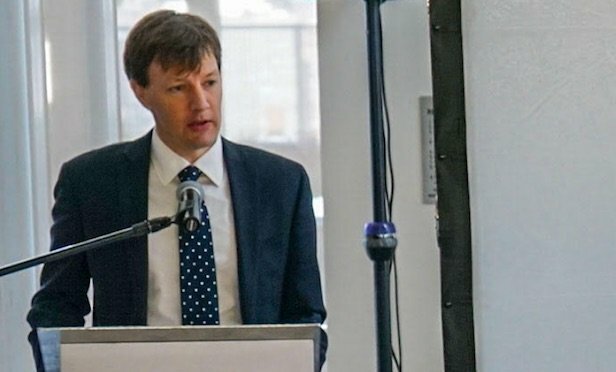 James Patchett, NYCEDC president and CEO, discusses a report which supports Long Island City as part of the life sciences hub, during an Oct. 16 presentation at Linc LIC. NEW YORK CITY—A study conducted by the Long Island City Partnership, a neighborhood development organization, concludes that Long Island City provides a critical opportunity to foster New York City’s life sciences industry. This is because the neighborhood offers affordable space, accessible transit and a vibrant community with a talented workforce.